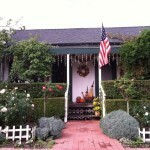 The Farm School on Los Rios is an extension of our Montessori School: http://www.farmschoolonlosrios.com. We offer cooking classes for our students and the local community during evenings and weekends. Located in historic San Juan Capistrano, we use The Farm School on Los Rios as our Land Lab for our older students who experience and enjoy gardening, cooking and woodworking. The property is as rich in history as it is in charm and features a 1903 board and batten cottage which is on the National Historic Register. Covered in roses and abundant plant life, we also have organic gardens, an organic pond and backyard chickens.